A crowd of students gathered to attend the preview. In fact, it was such a coveted experience that the Cosford reached maximum capacity well before the movie time. Students at the University of Miami are not the only ones who have garnered buzz over this movie. A Star is Born made over $42 million on its opening weekend. “Shallow,” the movie’s main song, peaked at #1 in the singles charts. Overall, the film has been a success. It received a 90% rating from critics and an 84% rating from general audiences on Rotten Tomatoes. So what makes this movie so buzz worthy? 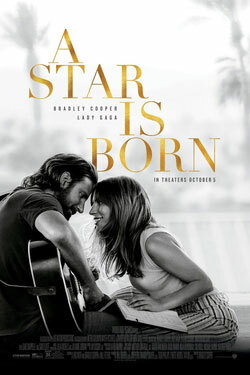 For starters, the film’s cast includes Bradley Cooper (who wrote, produced, directed, and starred in the movie), Sam Elliot, and Lady Gaga, who made her silver screen debut in this movie. Gaga who lends her beautiful vocals and stars as Ally, a talented undiscovered singer/songwriter who rises to fame with Jackson Maine, a tortured artist, by her side. Gaga and Cooper’s chemistry is evident as we follow Ally and Jackson’s roller coaster romance develop. The dialogue takes a backseat in this movie and gives a refreshing spotlight to the sensory details. Through the melodies, lyrics, and visuals we are not only taken through Ally’s journey to fame, but we are taken through her struggles with authenticity in the entertainment industry and Jackson’s addictions. This movie is a cinematic and musical masterpiece, but it doesn’t stop there. The harsh realities of addiction and depression are portrayed in a compassionate, yet realistic light through the character of Jackson Maine. Raw emotions and vulnerability are translated from the screen, bringing them to life. A Star is Born accurately emphasizes the seriousness of mental health. This film serves as a wakeup call to realize that the warning signs of mental health should not be ignored or suppressed, as they have tremendous effects on the victims and those around them. The film did a fantastic job of accurately depicting the fact that mental health issues are diseases and not choices. A Star is Born is a breakthrough in the media over the stigma surrounding mental health issues. This film is definitely one you don’t want to miss!